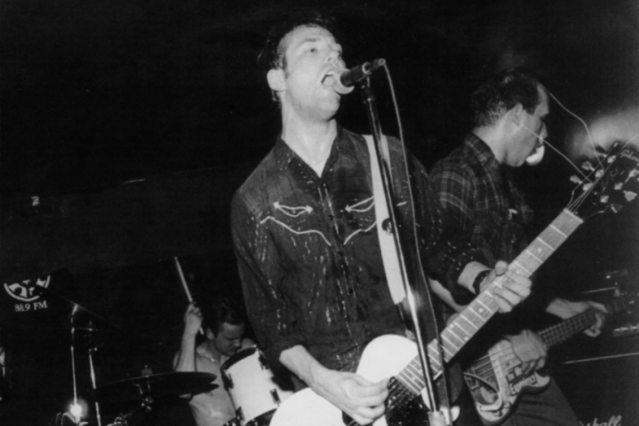 If there was a signature late-’90s “pop-punk sound,” the Lillingtons epitomized it, and their Death by Television album is a classic of the genre. I wrote a song with this title myself, but theirs rocks a lot harder. It took me quite a while to realize that’s what people were talking about when they requested that I play my “Lillingtons cover.” F.P. A beautiful, wistful song that simply won’t leave your head once it’s in there. F.P. The full majesty of the Smugglers’ live show was never really captured on record, but since the records are all we’ve got now, they’ll have to do. The Smugglers were a “suit band,” as opposed to a T-shirt band like most of us, which makes rock’n’roll just that much more difficult and impressive to pull off. Jumping up and down and screaming into a mic for 45 minutes straight is challenging enough when you’re not wearing full suit and tie. The first time I ever saw the Smugglers, the outfits were even more of a handicap — heavy pea coats, woolen caps, and big rubber Wellington boots. Either way, a couple of sets as a member of the Smugglers would have killed me dead, and I’m amazed they managed to play many of them. How did they manage to get along with each other in a tiny van containing themselves and the aforementioned suits? That was something I always wondered, till I noticed that they toured with a case of Febreze. Why they never won the Nobel Prize for rock’n’roll remains a mystery. F.P. “All I know is that I don’t know nothin'” — Socrates never looked so good hedge-diving with a chain wallet. They could have been bigger than the Beatles, but my fondest memories of this band involve living-room shows at house parties in the middle of nowhere for small gatherings of glassy-eyed zombie teenagers. Because you’ve got to start somewhere. F.P.